For when you find all other 911s just too boring. We all know that guy, the one who has a habit of taking just about everything to another level. This person could be an extreme sports fanatic, a scuba diver who swims with sharks, or even a pro sky diver. The list goes on. And, of course, there are those who love to go fast. 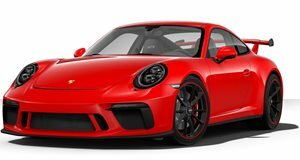 If they have the funds available, there are a number of choices out there, but perhaps one of their best options is the new Porsche 911 GT3. Yes, this latest GT3 is jammed-packed with electronic gizmos and is void of the beloved manual gearbox. A fast-shifting dual-clutch is in its place. But don’t think for a moment this track- focused 911 has gone soft. It produces 475 hp from its naturally aspirated 3.8-liter flat-six. That’s not normal. The GT3 may just be one of the best suited all-around cars for that lunatic we know. Or, perhaps, it’s you. Check out the official Motor Trend test drive in the video ahead.